1>Plug in the power cord and connect the camera to your router with the Ethernet cable. One end in the camera and the other in the router. 2>Download the Sricam app from the Android Play store or Apple App Store or by using the QR code in instruction leaflet. ( I prefer to use the app stores as I find the QR codes quite fiddly.) Register an account, and log in. Next use the pin provided (or any pin) to reset the camera. There is a small reset hole at the base of the camera. You need to fiddle a bit, till you hear a “ring” noise. 3>On the app press + add camera and enter details of your camera, either by scanning the QR code on base of camera or manually. 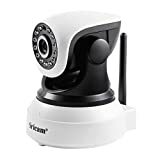 This entry was posted in Discount Photography and tagged 64GB, 720P, Alert, Audio, Camera, Card, Day&Night, Detect, Home, Micro, Motion, Remote, Security, Smart, Sricam, Support, Surveillance, Tilt, Vision, WebCam, WiFi, Wireless by Ball Photo. Bookmark the permalink.